Every relationship goes through ups and downs. They are part of what makes your relationship unique, not the existence of those ups and downs but how you and your significant other deal with those problems. In most cases they are not even about your relationship. A and I have been together for a bit longer than two years now and we have overcome many problems and yet we have still have to face the majority of our problems. I think most people will agree, when I say that 99% of every little misunderstanding can be solved with better communication (also the willigness to communicate). The last percent is your heart speaking and your mind trying to make it work, this – no one can influence. Now we are standing before our biggest challenge yet and we look at each other trying to guide us through this mess. A finished school and is now looking to relocate in any part of the world, I am trying to finish school and waiting for our next big chapter. We made lists and lists, A applied for several jobs and already had countless interviews but no offer yet. We keep telling each other that today might be the last day apart, tonight might be the last night that we will have to go to bed without each other. We know that it doesn’t work that quickly but we keep hoping. Last year A and I went to the Outer banks. We had a long list of things we wanted to do, dolphin watch, lighthouse tour, walking along the shore, collecting shells but mostly just enjoy being with each other and relax. Now you can see, where ever we go, I want it to be memorable and although the dolphin watch and the lighthouse tour were pretty cool, the adrenalin wasn’t really pumping through our veins. After about 20 minutes, when I was happily done with my 2fast2furious session, rental-guy sat down on his waverunner and jetted over to us. He yelled, “turn off the waverunner”. Which I instantly did – a little scared though, did I go too fast? (Through all of this A enjoyed the ride, he said it was the most joyous ride he ever had in his life). 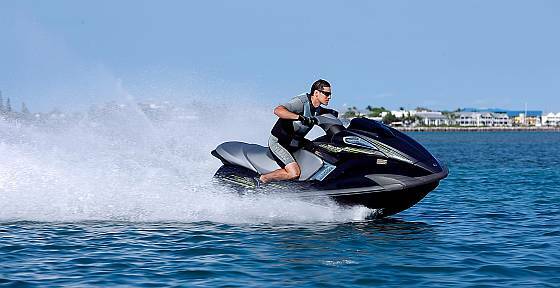 Rental guy asked me if I was okay – yes, he asked if the waverunner was okay – yes, he asked WHY THE HELL ARE YOU GOING SO SLOW???? No answer. I looked back at A and he was startled too! Too slow? Was that even possible? Rental guy told me to go across the soundside with 60 km/h which is like 37 m/h and just go as fast as I can and not let go. When I did as told I could feel how A was clinging onto life, since he was sitting at the back and couldn’t really see where I was going. This was also the point where I realized how much fun waverunning really was. Shortly after that I finished my turn and was returning to the pier when rental guy told me to give A a try, who reluctantly did as told and enjoyed his ride even more than I did. The stage of our relationship we are in now, is like the first 20 minutes of our waverunning… it’s going somewhere, we know that we’re moving and we know that eventually we’ll get to where we have to go, but sometimes the only thing we really have to do now is hit the gas and go as fast as we can to get there and enjoy the journey even more. Next time we will do that on the waverunners too.